Urbsounds Collective (The mutant electronic offspring of Bratislava, Slovakia’s punk scene) was established in 2001 as the outcome of friendship, common interests, shared views and love for music. 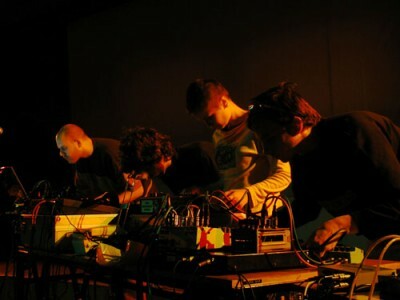 Since then it has become a platform for exchanging experience and supporting creative and unusual electronic and media events, distributing DIY materials, organizing experimental electronic music events and releasing mostly CD-r recordings. It played their first concert in November 2001 at the Academy of Fine Arts and Design in Bratislava. From that time on they have been performing at various galleries, clubs, squats and festivals [Digitopia/Slovakia, Multiplace/Slovakia, Next/Slovakia, Alternativa/Czech Republic, Electric Rain/Ireland, Resistance Festival/Great Britain, RX-TX/Slovenia, Grim Electronicitt_/France, Firmanent/Poland] in Slovakia as well as abroad [Austria, Germany, Slovenia, Czech Republic, Switzerland, Italy, France, Great Britain and Ireland].